Equal consideration is given to design, workmanship and materials in each piece which can be tailored to the customer's needs, tastes and ideas. Scale drawings are always produced and agreed to by the customer before work starts on the piece. Nearly every commission for a piece of Hugo Egleston furniture results in a completely new design, although he is more than happy to repeat a design. When designing a piece, he feels he has to combine the customer's requirements and ideas with his experience to produce something of lasting beauty and usefulness. This means designing pieces, using shapes and proportions which are both appealing and harmonious which are sturdy but not too heavy and also sophisticated to show off the skills of the maker and the fine materials. Hugo Egleston has a considerable stock of timber at his workshop, especially scarce ones (like English Walnut, which is virtually unobtainable from timber merchants) so that exactly the right wood can be selected for each piece. Nearly all Hugo Egleston's furniture is made of solid wood, carefully selected, especially the finer, decorative ones such as Cherry, Yew, Walnut and Rosewood. As the materials are only a small proportion of the cost, it makes sense to use only the best. After all, the furniture, however well it is made, is only the materials it is from. When, as is occasionally necessary, veneers are used, they are thick, saw-cut ones. Most of the wood is seasoned in his drying-sheds for many years. Hugo believes that wood used in the correct thicknesses gives much nicer proportion and visual weight to a piece than metal or plastic. It is also much more interesting to look at, and feels and ages better. 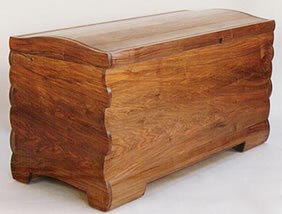 Many of the pieces have shaping and modelling only possible in solid wood. Hugo Egleston furniture is made to an impeccable standard of workmanship. He recently won the Gold Award in the Furniture and Cabinet Making magazine competition. Most of his designs require this high standard to produce their full effect. Much of the work is unseen, but necessary to ensure his furniture will stand wear and tear for many years to come.